Have you ever felt like you have lived somewhere for so long, but you really haven’t seen everything that is has to offer? That you feel like you are missing out on everything it has to offer? That is the situation we found ourselves in recently. 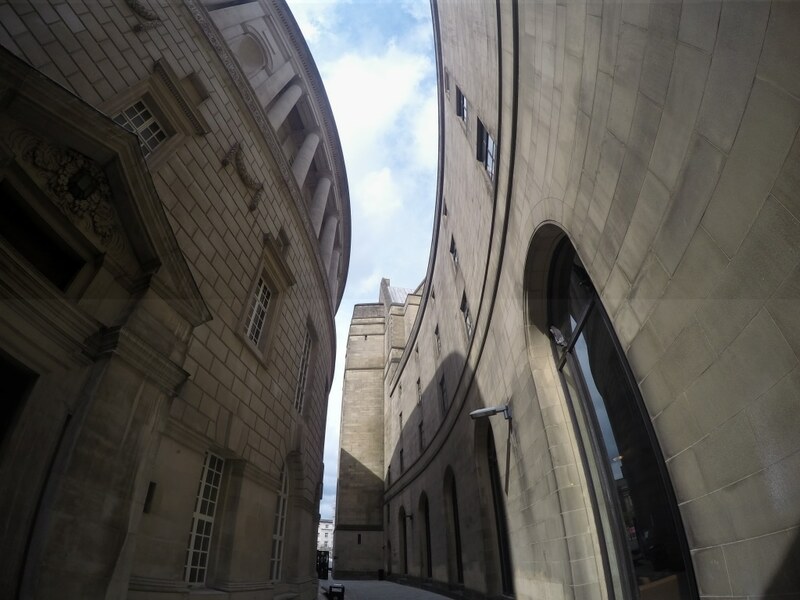 We just had our 10 year ‘living in Manchester’ anniversary and quickly realised that we have seen so little of the city. 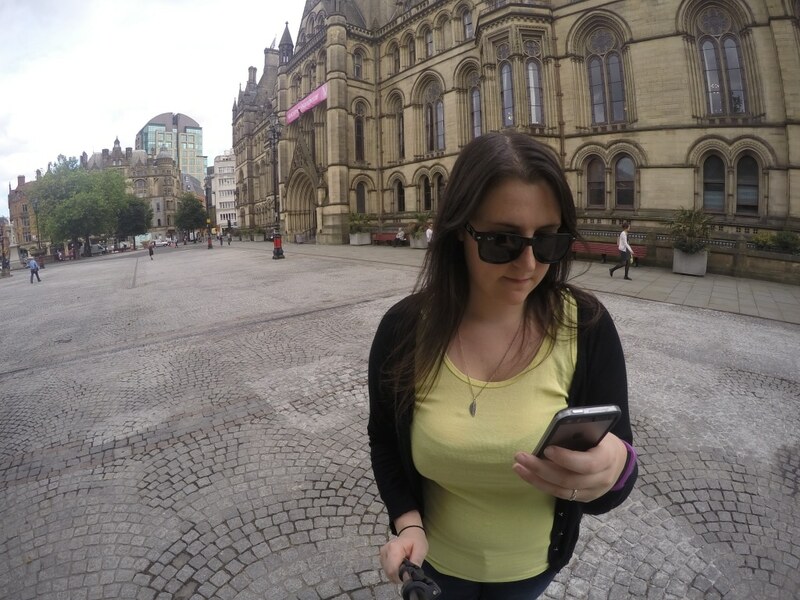 Manchester has so many tourists visiting, but what are they seeing? We have not seen any of it. We are missing out on really experiencing our city! 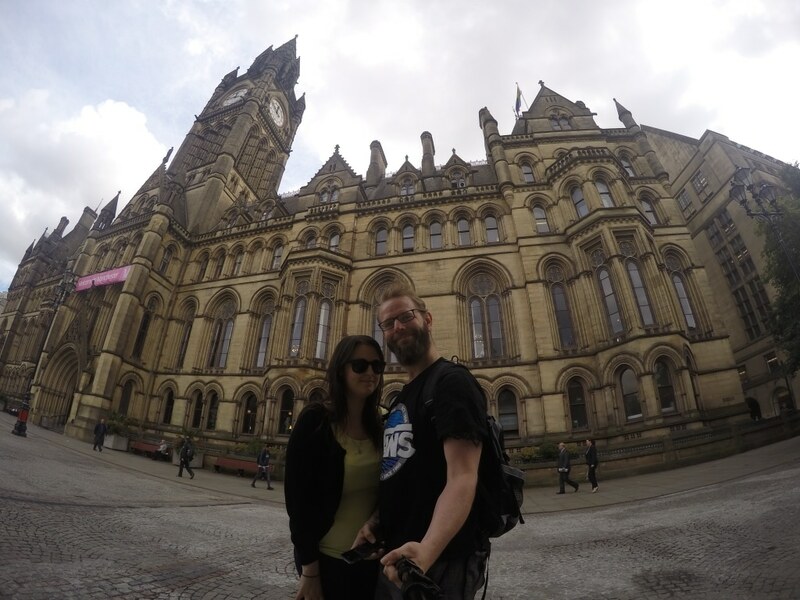 Dave has been putting together his before 40 bucket list and one of the things on it was to see/do all of the things in Manchester that he has wanted to do. 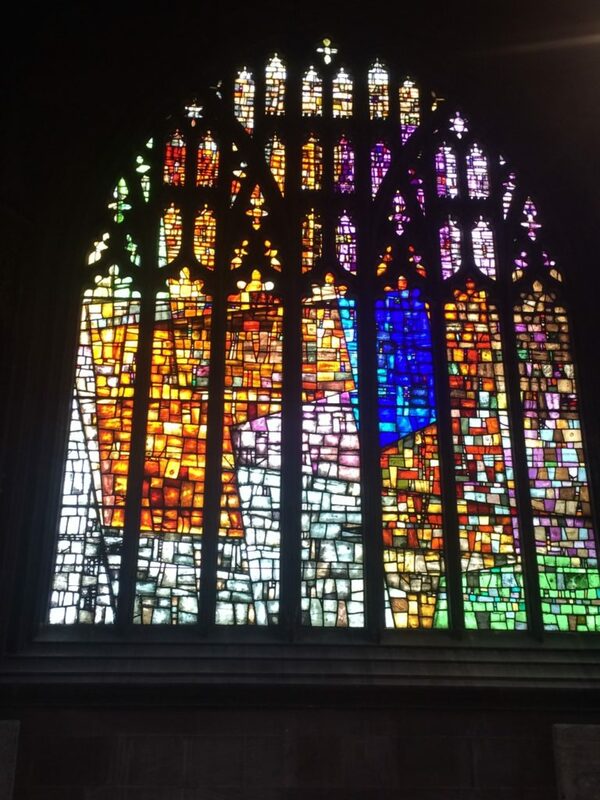 Visit the top restaurant, go to the top attractions, eat the best cake, do all of the things that Manchester is known for. 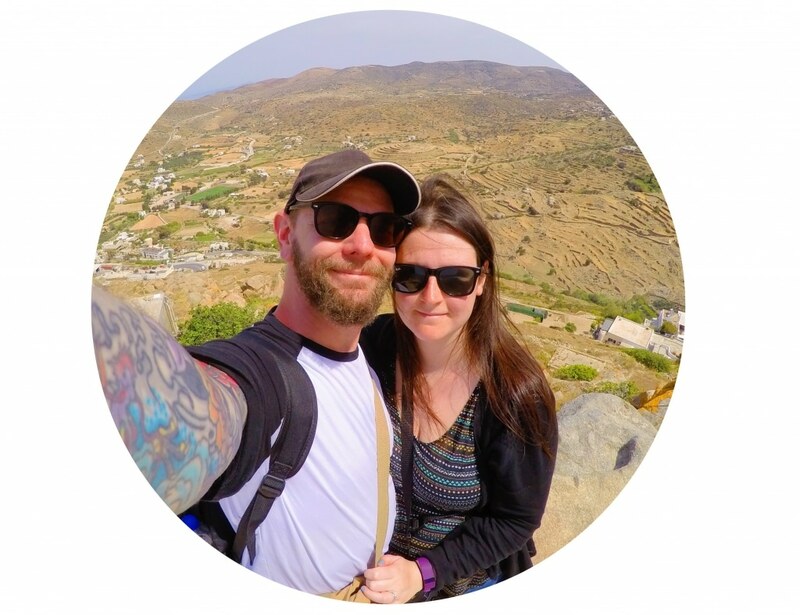 When MoneySuperMarket contacted me recently and asked me if I would like to do something nice for someone else and help them to ‘Balance Transfer’ their life, I knew that I was going to do something nice for Dave and help him tick something off his bucket list. He has been SO incredibly supportive through the past year with me getting the HHH book finish, this is my way of saying thank you. MoneySuperMarket’s ‘Balance Transfer Your Life’ project aims to replicate the epic feeling of clearing a debt. We can totally relate to that, as we have been working on clearing some of our debt this year and it feels SO good. Financially, this can be achieved by making a balance transfer, but what MoneySuperMarket want to do is help people clear something really important from their everyday to-do list, making them feel epic when the task is complete – which is why I chose to help Dave tick off his Manchester-to-do list. MoneySuperMarket want open up ‘Balance Transfer Your Life’ to all of you through a competition. If you know someone who deserves a little happiness and peace of mind, then they’d love to help them tick off a meaningful task from their to-do list. Simply tweet @MoneySupermkt using #BTYL and let us know who you think should win and why. We’ll choose the most deserving person, and draft in the relevant experts to get the job done (in style). 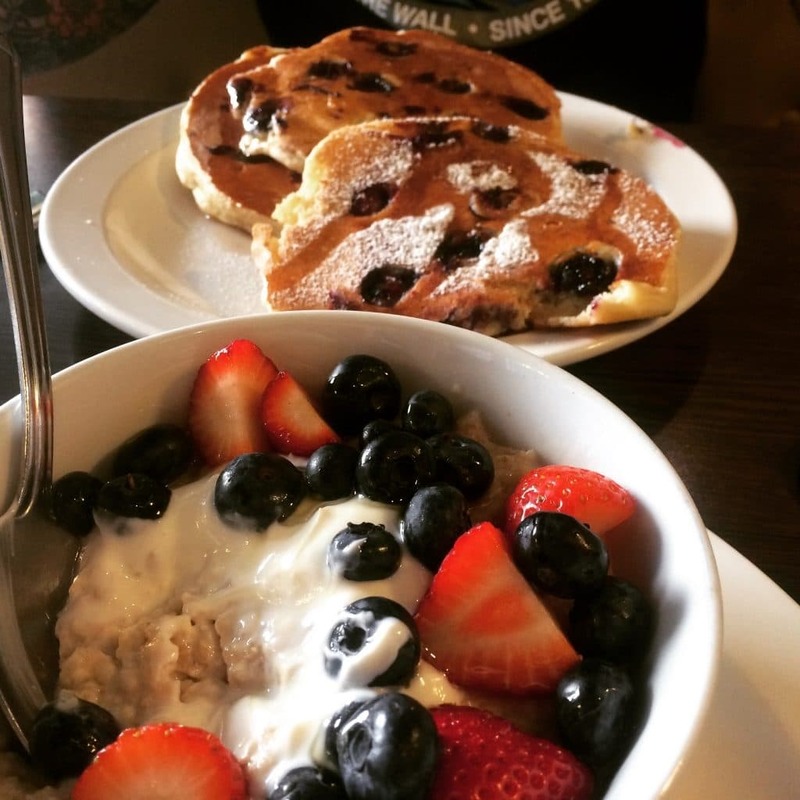 Manchester is actually a great place to get breakfast. We have some amazing options, but the best is considered to be Moose Coffee. They are an American/Canadian breakfast place where you can get every kind of indulgent breakfast possible, so I had porridge. I know, I know, I am missing out. But I am trying to really stay on track this week and I have a bit weekend planned, where I am going to indulge, so I went with the porridge with yoghurt and berries. Don’t worry, Dave went with the blueberry pancakes with butter and syrup and it was big enough for 6 people. Manchester is known for a lot of things. Football, music, universities, but you would think it would be known for Libraries. 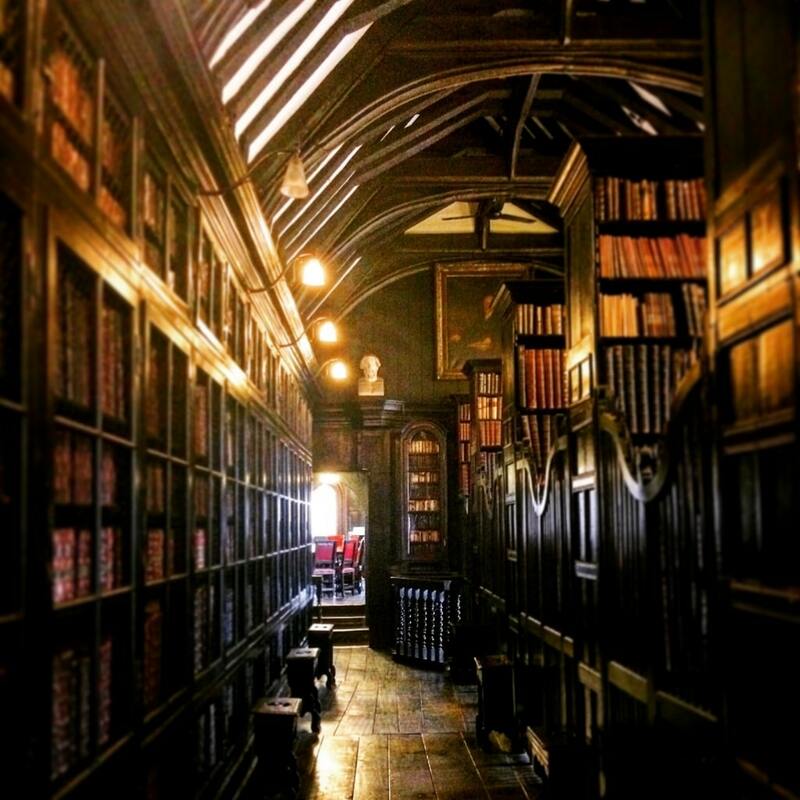 Some of the top things to see in Manchester on Trip Advisor are libraries and whilst you might not thing that is particularly exciting, the buildings are amazing. The first up is the Portico library, which we actually always thought was a pub. The bottom part is a pub, but the top is actually a subscription library that was built in 1802. It was a meeting place for business men and now houses mostly 19th Century literature. 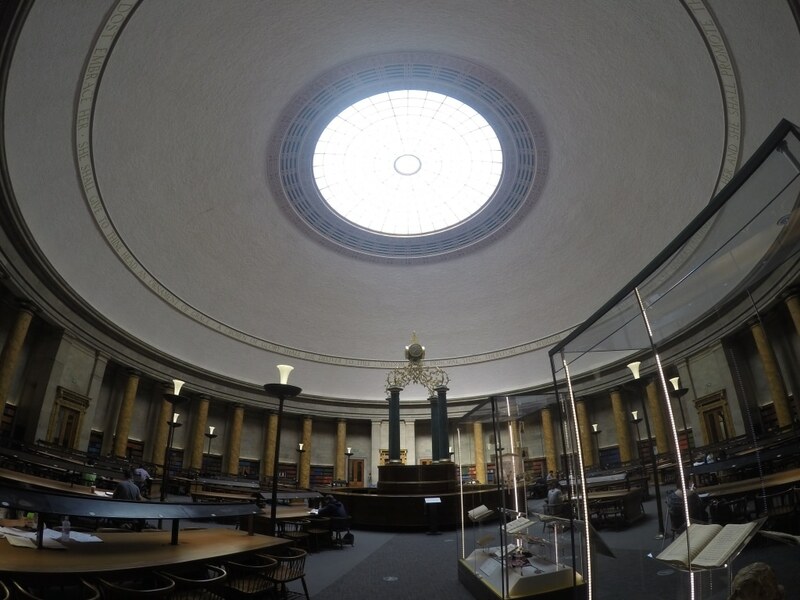 Next up with the Central Library which has been closed for the past couple of years for refurbishment. 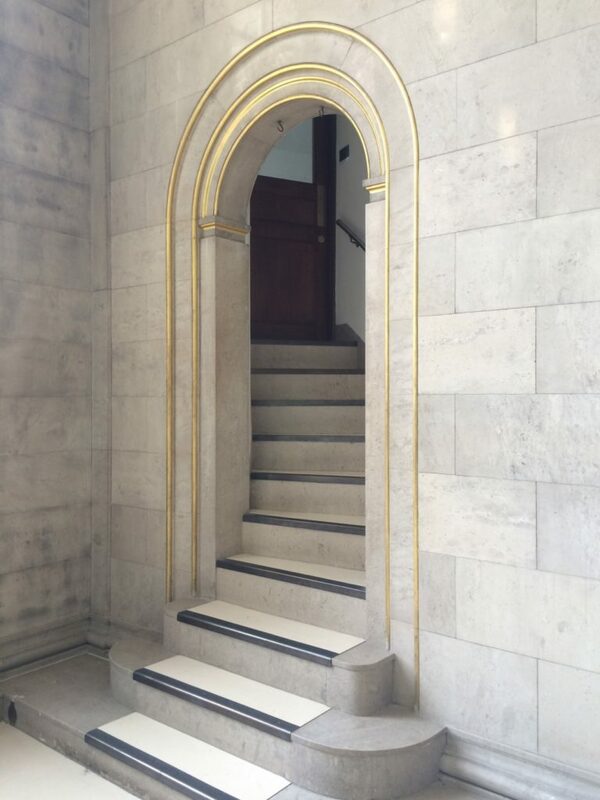 They have done a really good job of incorporating the new modern parts with the original parts which were constructed in 1930. The design of the building was actually based loosely on the Pantheon in Rome. They have lots of little doorways too, but they are blocked off, so who knows where they go to! 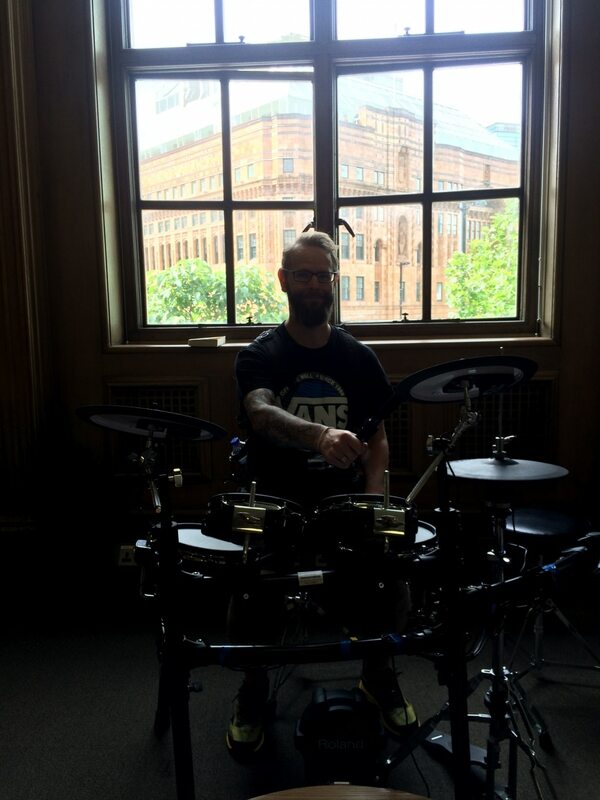 Oh, and you can hire music equipment in the library too, there is even a drum kit. 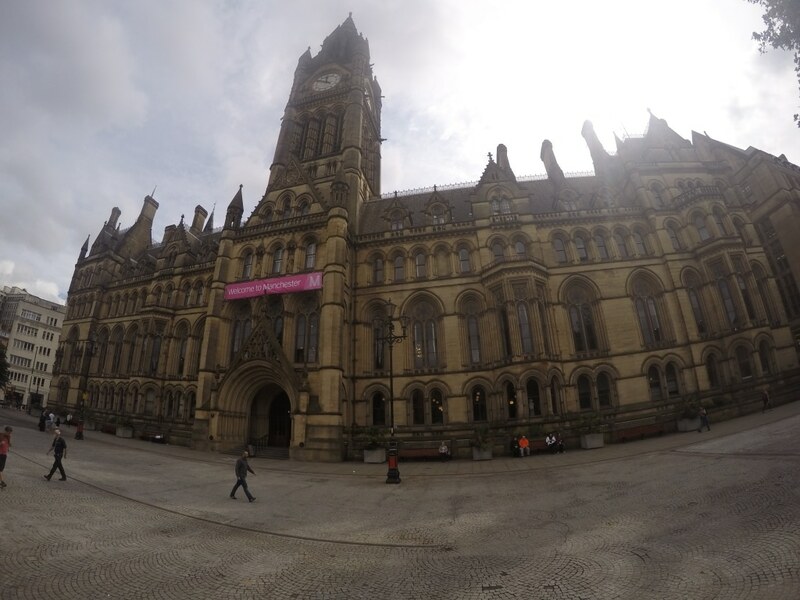 Taking a bit of a break from libraries, we went and spent some time at one of Manchester’s most iconic buildings, the Town Hall. It was built in 1877 and is a neo-gothic building that is the head quarters for the city council. The only time we usually spend around the town hall is when they have the Bavarian Christmas market there and there is a giant Santa hanging off the building. So, it was nice to see it a little quieter. I am not sure why I look so short in the picture below. I am only about 3 inches shorter than Dave. I blame the Go Pro. Even stay-at-home tourists have time for Instagram. 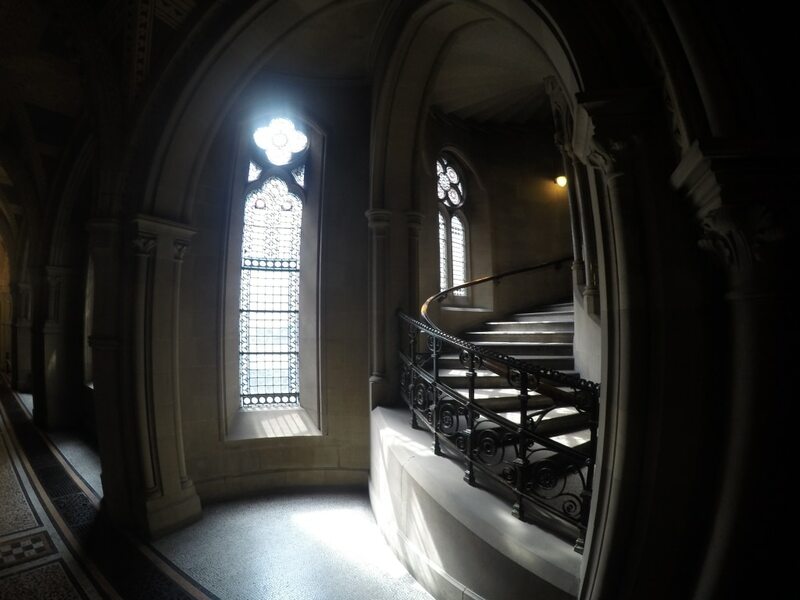 The inside of the Town Hall is just as stunning as the outside. Although a lot of it doesn’t have public access, you can walk around a little. Lots of corridors and staircases. 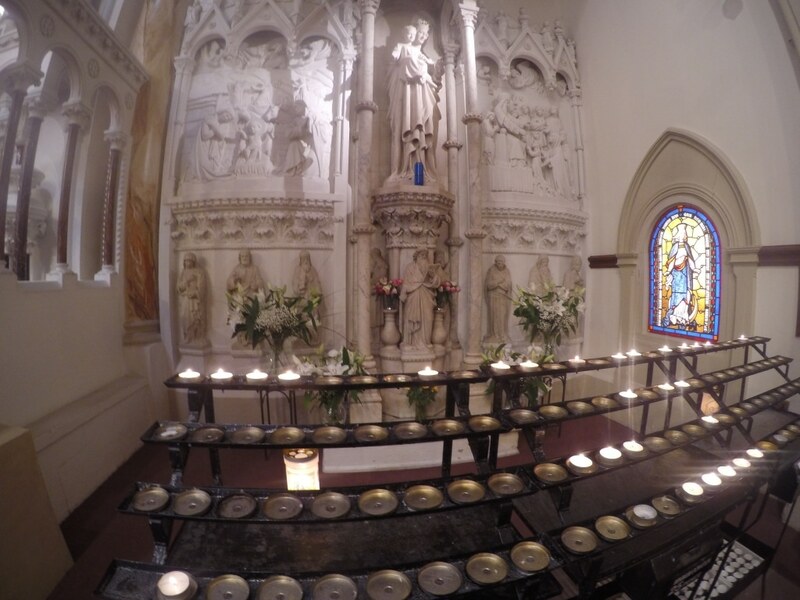 On our way to the next library, we stopped off at The Hidden Gem church, which you would never know was there, unless you knew it was there. It is off a main walkway and the road it is one doesn’t actually lead to anywhere else. 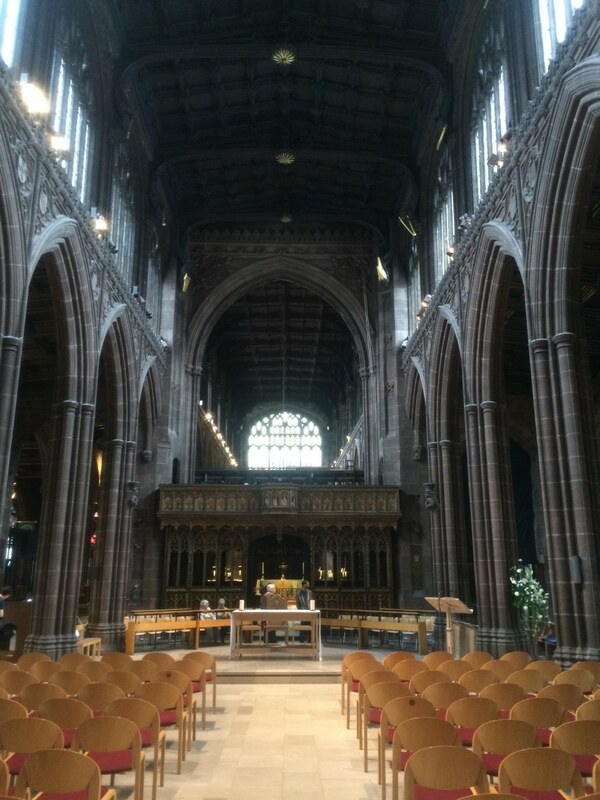 The Hidden Gem, also known as St Mary’s Roman Catholic Church was dedicated in 1794 and is Manchester’s oldest church. 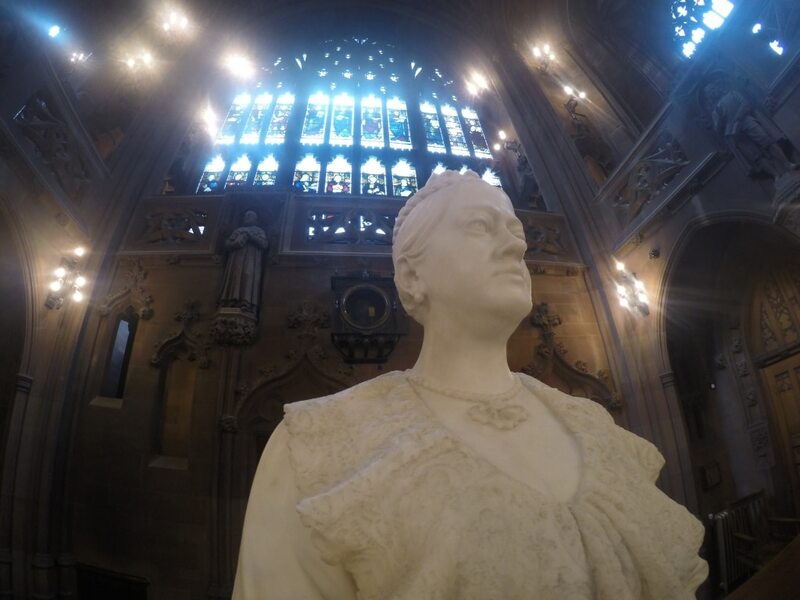 Next it was on to Manchester’s number one tourist attraction, and that is John Ryland’s Library. 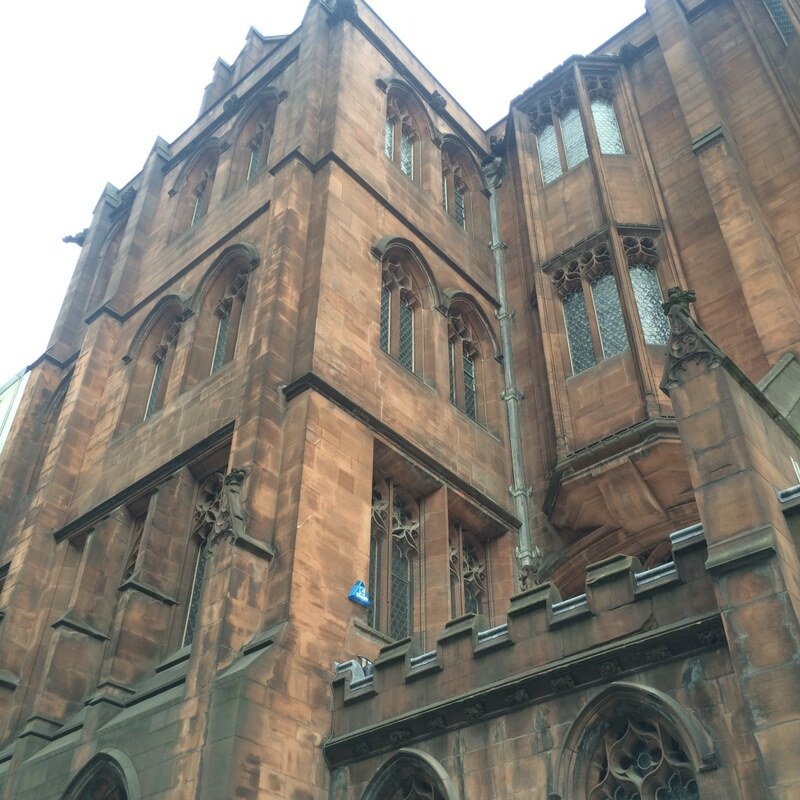 The late neo-gothic building is on Deansgate and I have been past it hundreds of times before, but next gone in, because it is “just” a library. What an amazing building and it has the best gift shop too. I do love a gift shop. 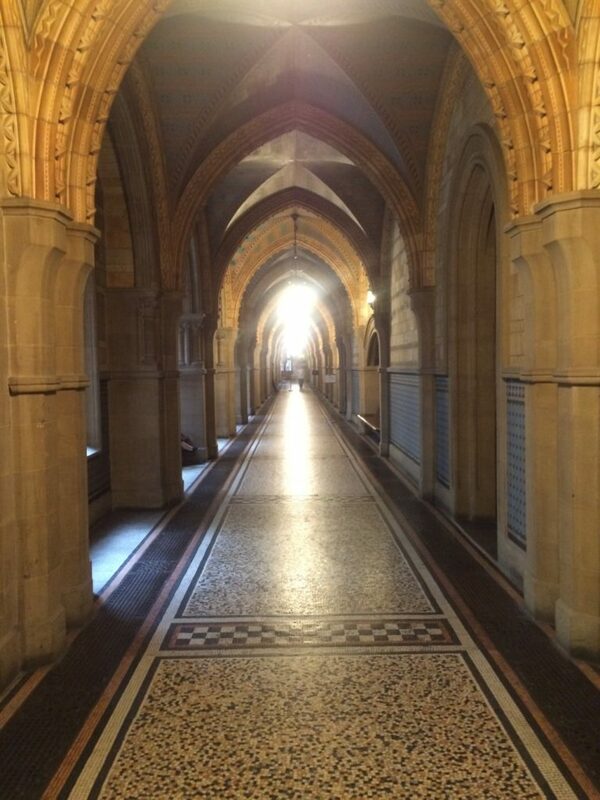 The library opened to the public in 1900 and it has the most stunning reading room. I wish I had of gone there to study whilst writing my dissertation, I don’t think I would of had as much writers block as I did. Or maybe I would have had more, as I would have been too busy staring at everything around me. 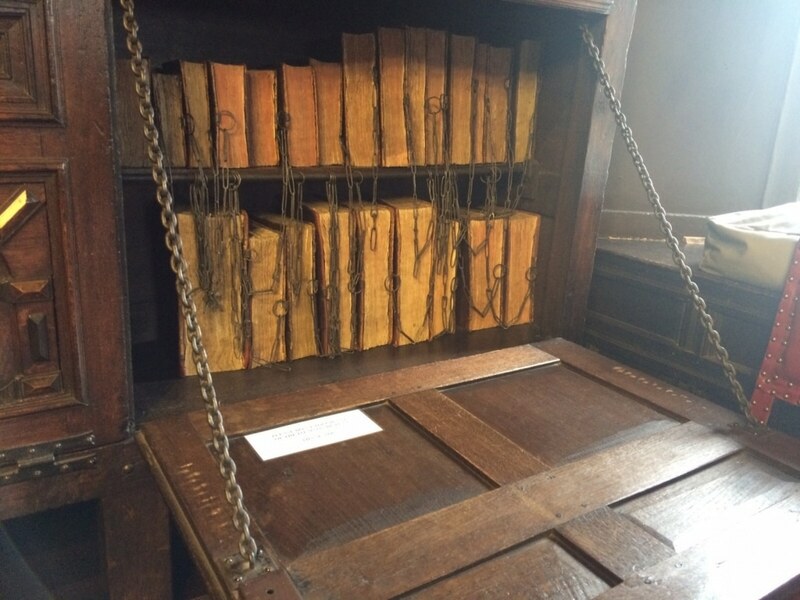 John Ryland’s library also has Papyrus 52, also known at the St John’s Fragment, which is believed to be the oldest extanat New Testament text. 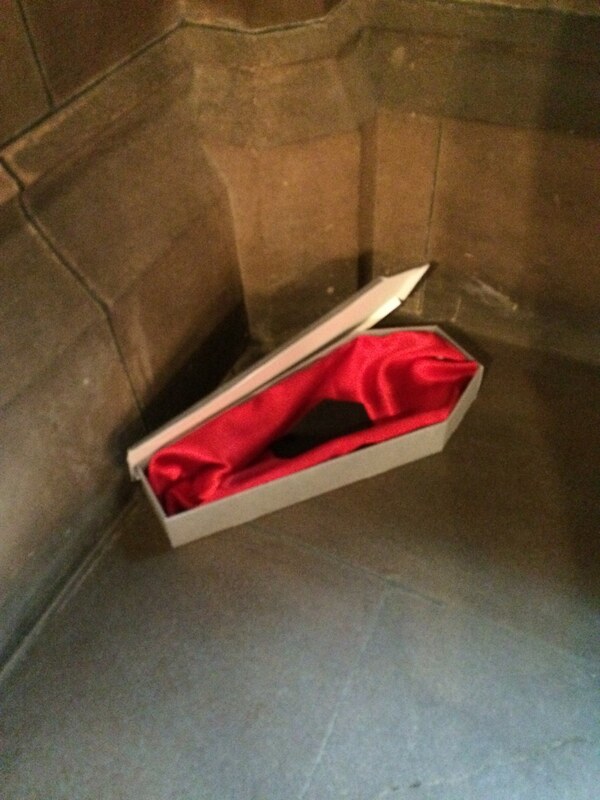 Oh, and something weird we came across….a very tiny coffin sitting in a corner of a hallway. Ermm, okay. After all that walking, it was time for some lunch! Dave had ticked off most of the places in Manchester that he wanted to see, but he had always wanted to go to Manchester’s top rated restaurant and on Trip Advisor that is now Fazenda. Fazenda is a Brazilian restaurant that specialises in meat, so not the best place for 2 non meat eaters to go to, but I have heard that they have an EPIC salad bar, and we do love our salad. 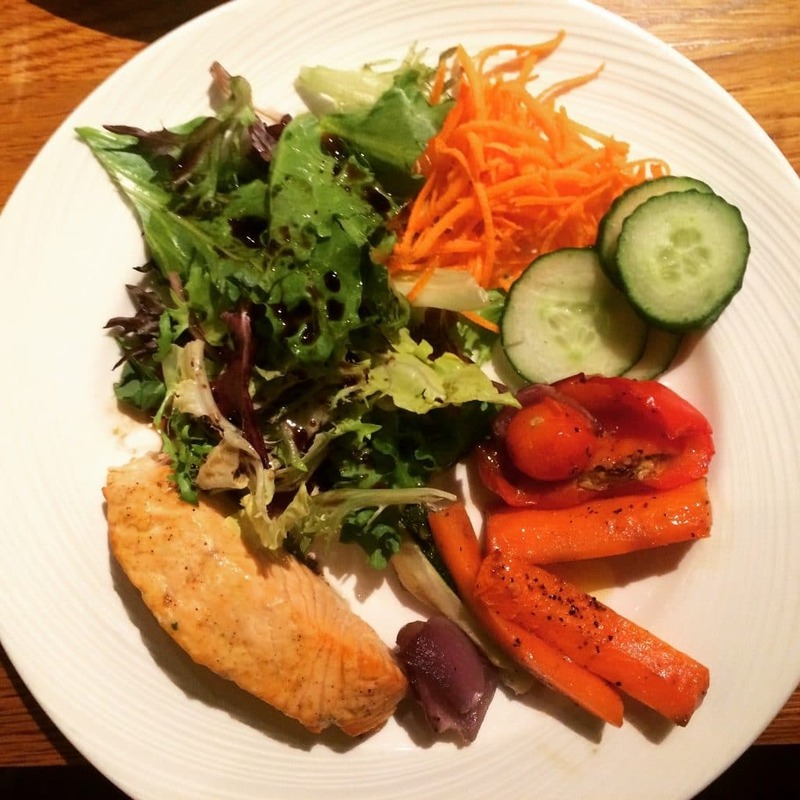 You can get salmon instead of the meat and they have pasta and risotto too and just keep going back for salad. It is fairly expensive (for us anyway), at £18 each, but I think we got our money worth in salad. The staff were pretty rude, but the food was excellent and if you checked-in on Facebook, you got a free cocktail. After all that food, we needed to walk it off, so we went to the next place on Dave’s Manchester-to-do list and that was the National Football Museum. Manchester is the best place to have a football museum, as we have 2 of the best football teams in the world (**waits for angry fans of other teams to comment**) and it was much more interesting than I thought it would be. So interesting that I forgot to take any pictures. 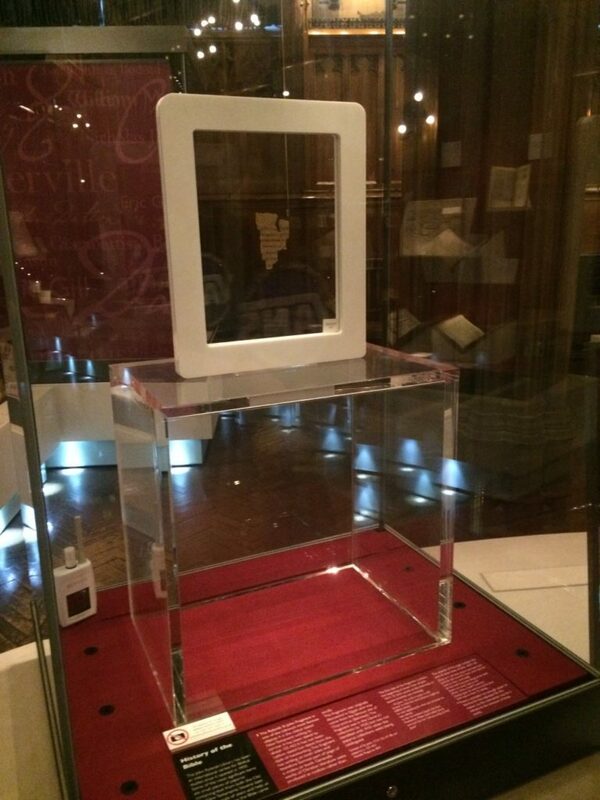 The museum celebrates some of the best footballers in their hall of fame, shows some of the famous stadiums and so much more. 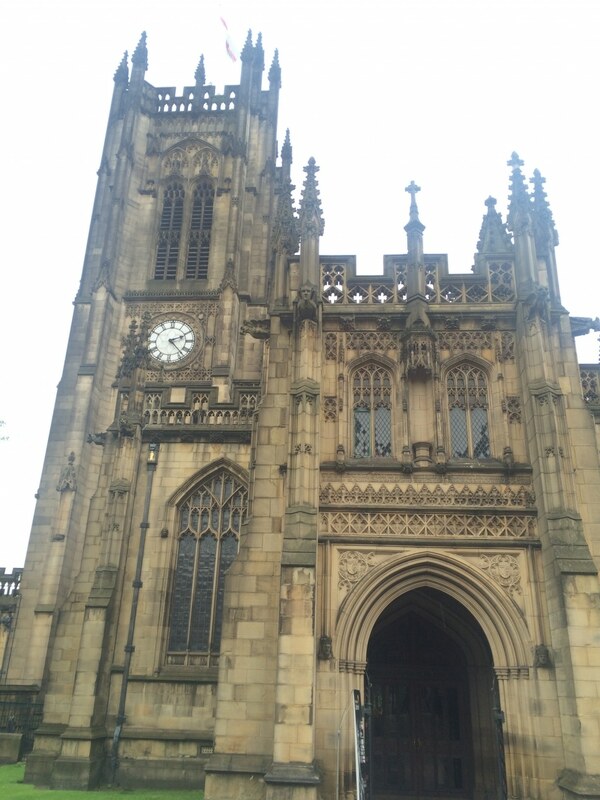 Just around the corner is the stunning Manchester Cathedral, which was built in 1421. 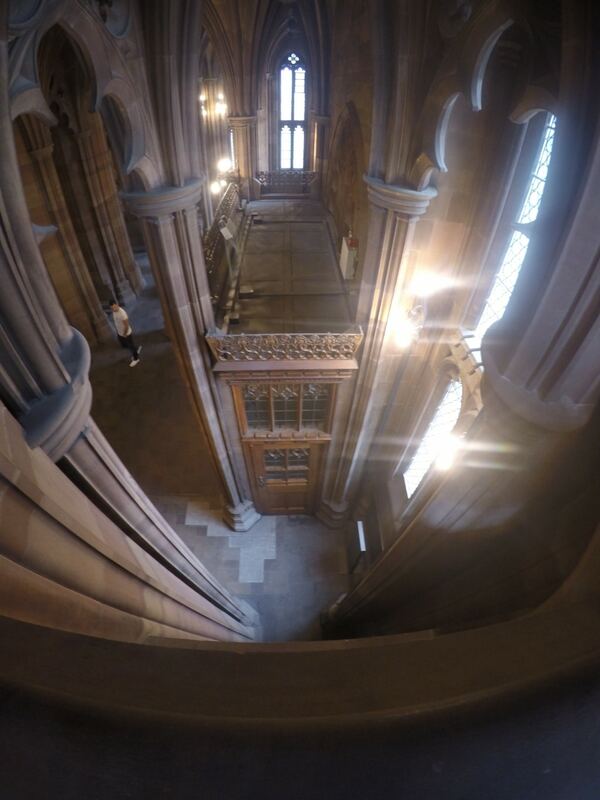 This incredible building costs £2000 a day to stay open and relies on donations from visitors. Many of the places we went to were free, but I think it is important to donate generously, as it really does help them to keep these places open. 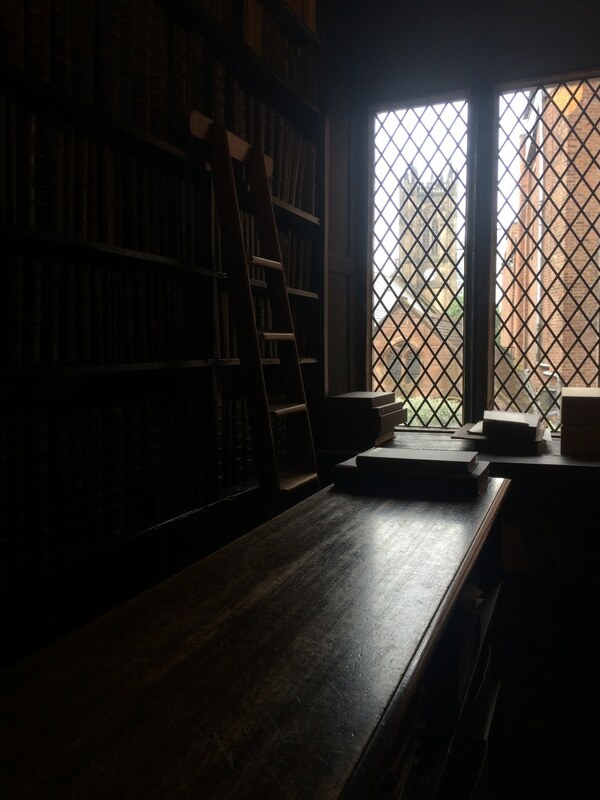 We then went to our final library of the day, and possibly my favourite stop of the day – Chetham’s Library. 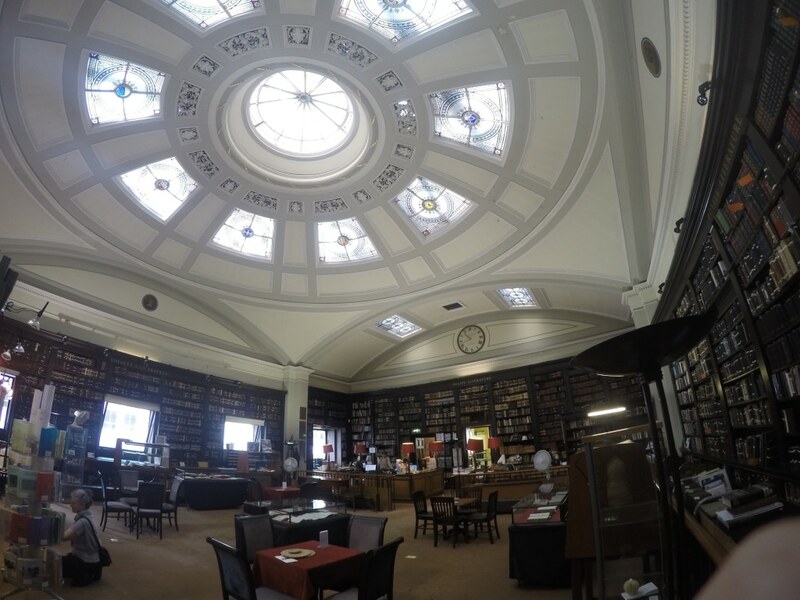 Established in 1653, it is Britain’s oldest public library and it was the meeting point for Karl Marx and Friedrich Engles, and where they started writing the Communist Manifesto. 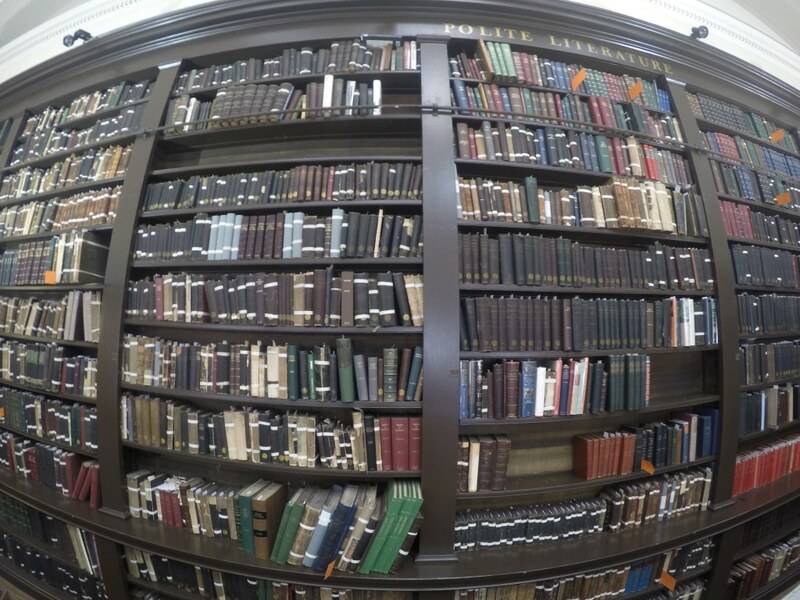 The library holds more than 100,000 volumes, of which 60,000 were published before 1851. It has kind of an eerie feel to it, and everything creaks, but it just oozes history. 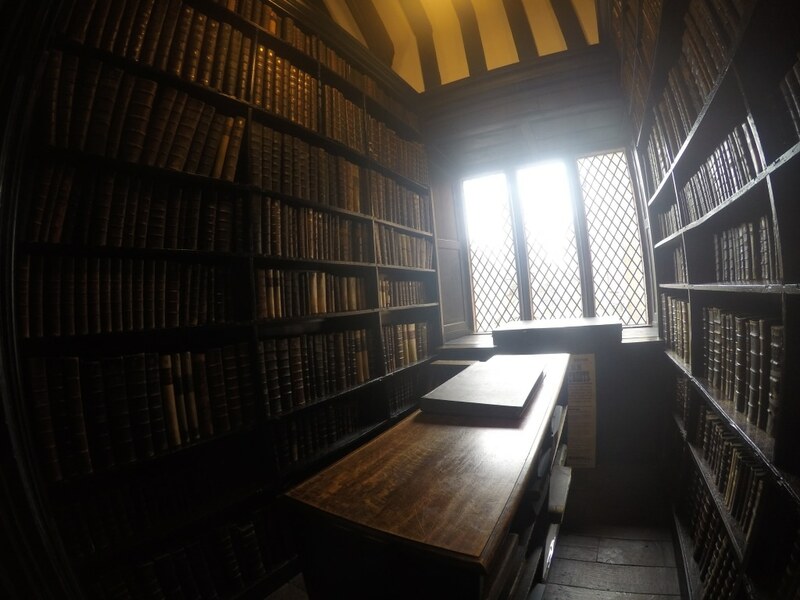 I would happily spend many an hour in there reading, and I think I might just do that. 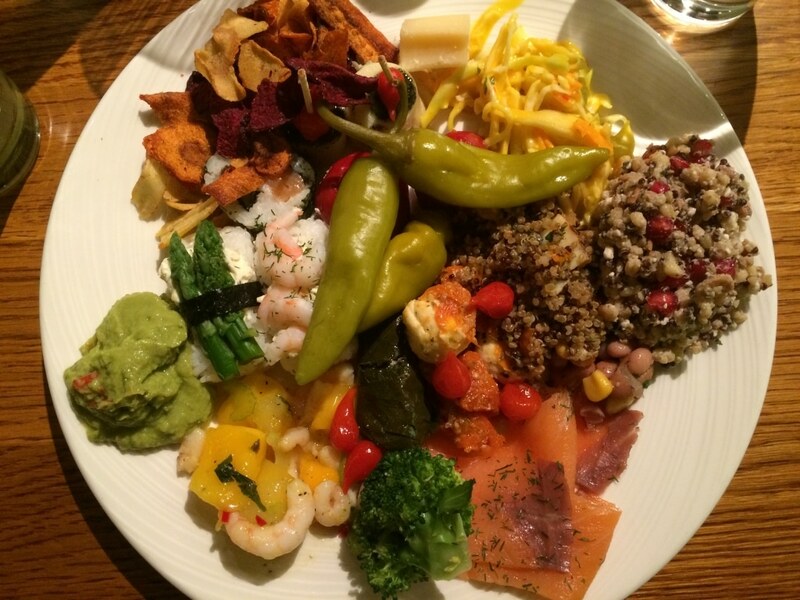 You would think that we would be too full from the epic salad bar, but there is always time for tea and cake, right? We headed to the number 1 tea and cake place in Manchester – Teacup Kitchen. 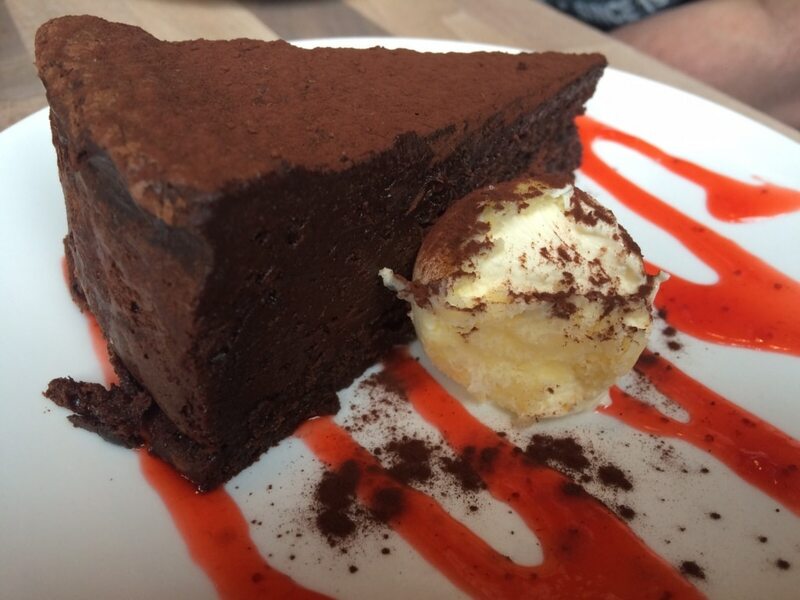 They have the most insanely good gluten free flourless chocolate cake. It is so rich, that even Dave, Mr Chocoholic, can’t eat a whole piece to himself. 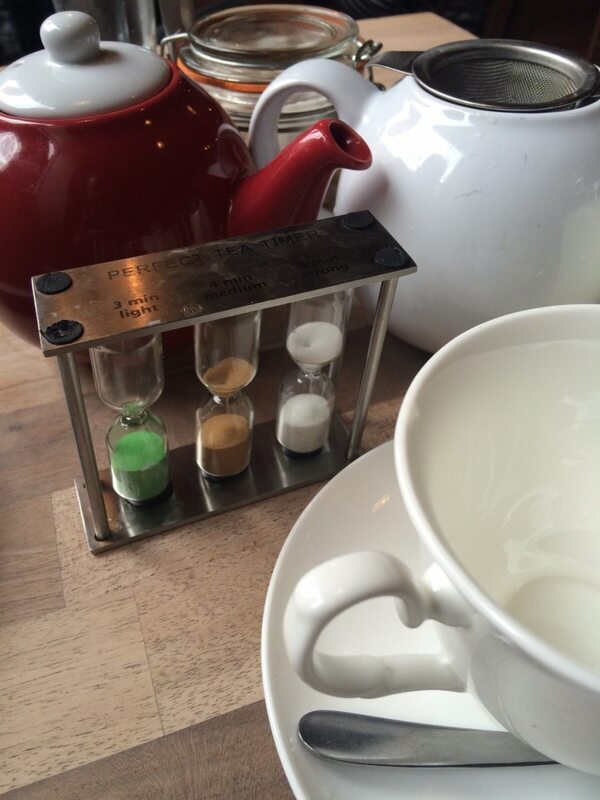 We got a pot of Indian Chai tea too, which comes with this cool little timer to tell you when it is ready to drink. 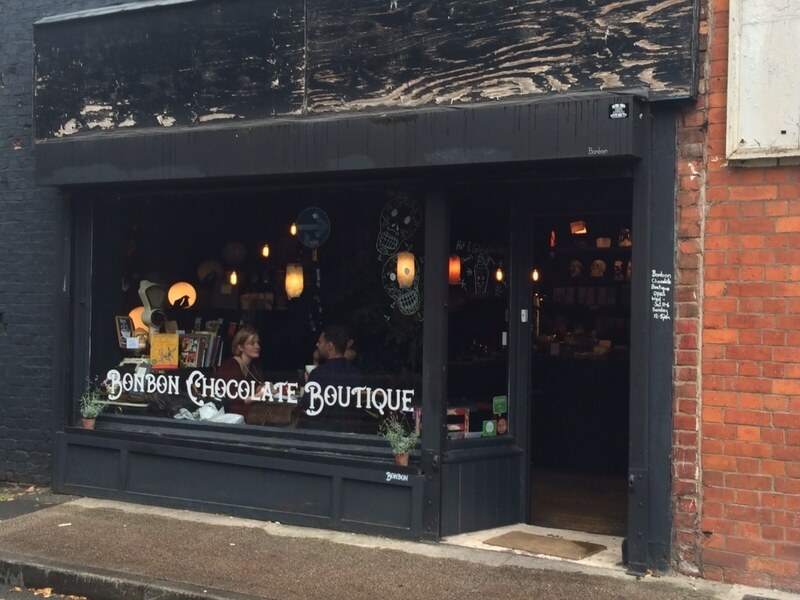 Just around the corner is a cute little chocolate shop that does homemade chocolates, and would have been rude to not pop in and buy some. They are expensive, but excellent quality, so it is worth paying for. This part of Manchester, the Northern Quarter, is my favourite part of Manchester. 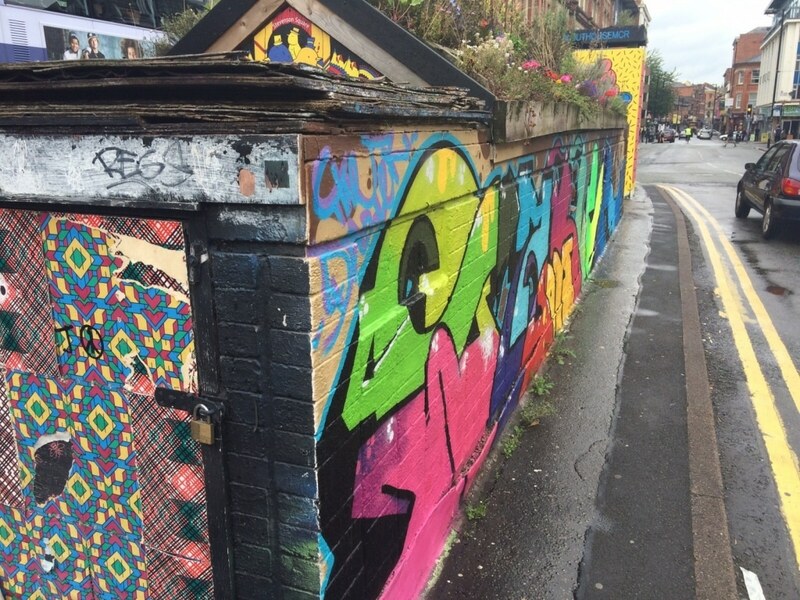 It’s really quirky, it has the best bars and there is lots of random street art. We were shattered at this point and had walked over 20,000 steps, but the day was not over. We went home to shower, change, give the cats some attention and then it was out again to one of the best live music venues in Manchester – Night and Day. Dave is always complaining that we don’t see enough live music, so on a day dedicated to Dave doing all of his favourite Manchester things, we went to see some live music. There were 4 local bands on, 2 of them good and 2 of them not so good, but it was a good night. The plan was have a meal out somewhere, but we really weren’t hungry before the gig, so we decided to take advantage of Manchester’s new delivery service Deliveroo. 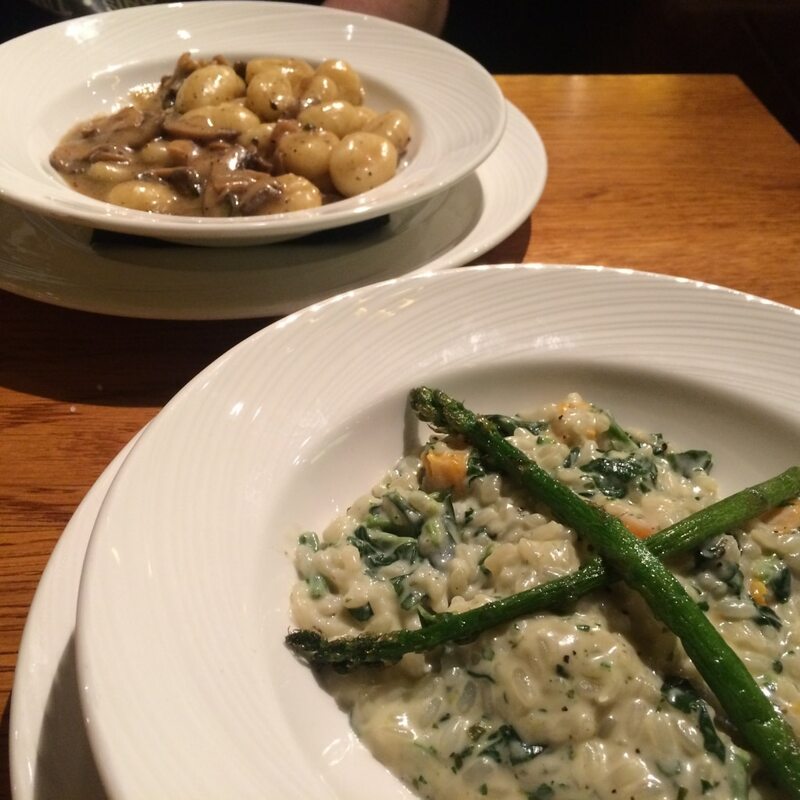 Do you love the food at your favourite restaurant, but find it is a hassle to actually leave the house sometimes? Well, Deliveroo delivers food from some of the best restaurants in Manchester. Dave picked our favourite pizza place, Dough, which thankfully does delicious gluten free pizza. I think Dave took advantage of it being a day all about him, as he convinced me to play computer games with him whilst we waiting for the pizza. Actually, Guitar Hero is a lot of fun. So, there you have it. I hope you have enjoyed this tour around the awesome city that I live in. You know what, our day of being a tourist has made me love it even more and Dave got to tick off most of the things on his list. 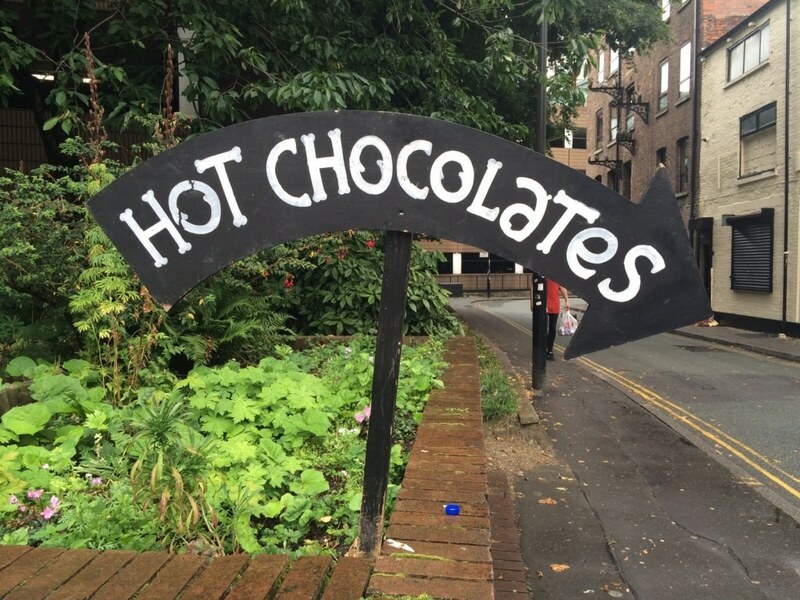 It is expensive, but nice for a treat and their hot chocolate is insanely good. I think it’s nice to be a tourist in your own city sometimes. 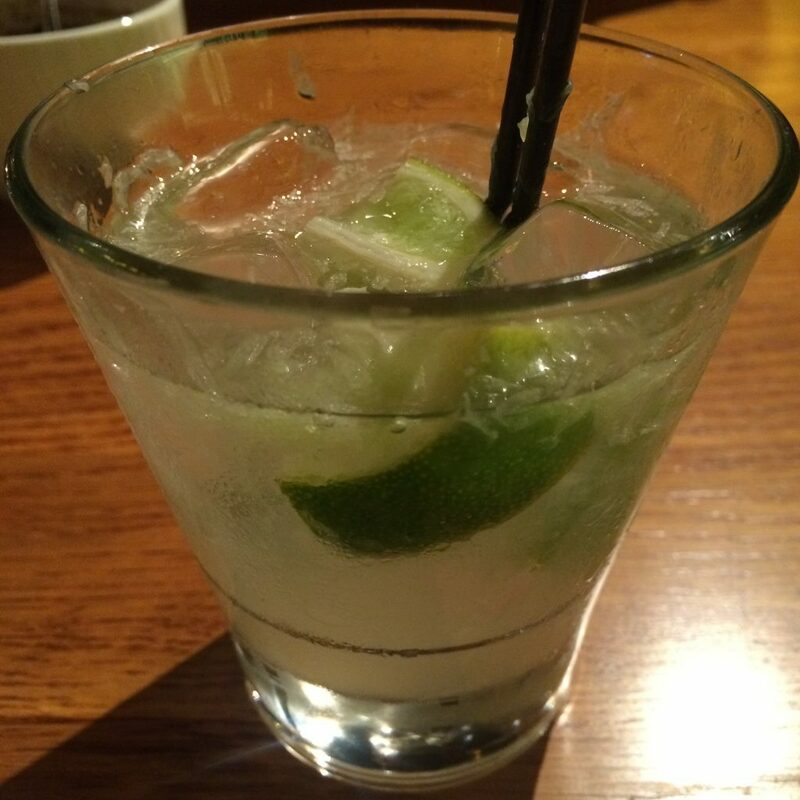 I really did have a fantastic day – thank you for indulging me. 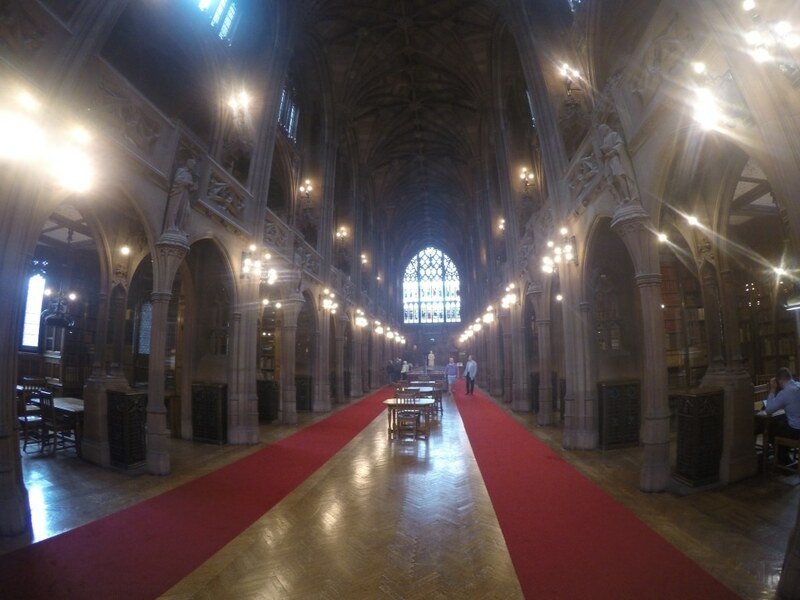 The Cheetham Library was my favourite part too – I felt like we were in Harry Potter! Oh, and all the food was pretty awesome too! You’re so right, it’s funny how we tend to not explore our own cities.. glad you had a chance to play tourist in Manchester!